My blog typically is not a commentary of my day to day life, but this weekend's activities were the culmination of so much planning and preparation that I have decided to give a play by play of the weekend's events. Before I get started, however, there is something that I want to say. You know how when you are planning for a big event, whether it is a party, a shower, a wedding, or a sporting event, you have in your mind exactly how you want it to go. You know that due to different variables, your expectations may not be met, but you hope that generally things will go just as you had planned. This weekend was an example of a big event happening just as I had anticipated - my expectations were high and my goals lofty, but the experience really couldn't have been any better. The weekend's events started Friday night. We got out to the Mississinewa campground around 5:00 (right on schedule, I couldn't believe it) and started getting set up. I was so excited to have a guest camping with us for the evening - my mom. My mom loves the atmosphere of camping with the accomodations of a condo, so I was quite surprised that she agreed to spend the night in our camper. It is so hard to find this campground, though, that it was the realistic decision to make so she could be sure to make the race in the morning. The Rowleys soon followed, then the Mundays, then Lynn, Missy, and Rob, then Jill, and finally Tanna and the kids (like I said, the campgrounds are almost impossible to find, and there is no cell phone reception in the area, so Tanna took a few detours but finally made it - pulling the camper with three kids in the car. She's the woman.) We had an unbelievable pre-triathlon dinner with spaghetti and too many sides to list. After dinner we relaxed around the fire, went over our strategy for the next day, and then Lynn surprised everyone by bringing out fan t-shirts for the next day. Kelley, Lynn, Missy, and Jaena had decorated the t-shirts the night before - Jason and Mom had one that said "Go Deb" and the kids wore ones that said "Go Mom." They were very cute, and you can kind of see them in the pictures below. It was so awesome of them to not only attend the race but to show this kind of support. Have I mentioned in previous blogs what a great circle of friendship we have? After our evening festivities, I headed into the camper to pack for the next day - bike shorts and shirt, running shorts and shirt (with number 142 pinned to it) goggles, swim cap, swim towel, water, and an extra pair of shoes and socks. I got to bed around 11:00, very apprehensive about what the next day would bring. The main thing I was worried about was the swim - not completing the swim but the temperature of the water. On weather. com, the projected temperature at 8:30 was 62 degrees, and at check-in the night before, the ladies had said the water temperature a week ago was 74.8 degrees. I was beginning to think I should have bought a wetsuit. 6:30 came before I knew it and it was game time. I put on my swimsuit, then I put on some shorts and a long sleeve t-shirt over it. I ate a small breakfast of some kind of Post cereal I had gotten on coupon and half a banana. I had to force that down because I was not feeling too hungry. Man, was it cold outside - probably high 50's. We grabbed our stuff after breakfast and biked down to the transition area by the beach - this is where we would park our bikes and keep our stuff. The first thing I noticed was that our bikes weren't like the other bikes. Almost all of the other bikes did not have kickstands, so people were "hanging" their bikes on the rack. I didn't even need a rack - I just put my kickstand down. We were all three using mountain bikes which have much fatter tires and I am sure are much heavier than the road bikes the others were using. When I was at the bike store on Thursday, the owner said that even swapping out my tires for thinner ones would add 3 miles an hour to my ride. Maybe for next time. After situating our stuff, we had to go get marked. Our age was put in marker on our calf, and our number was put on our biceps. Then all we could do was wait. There was a kid's run right before the start of our race, and that was a good distraction. 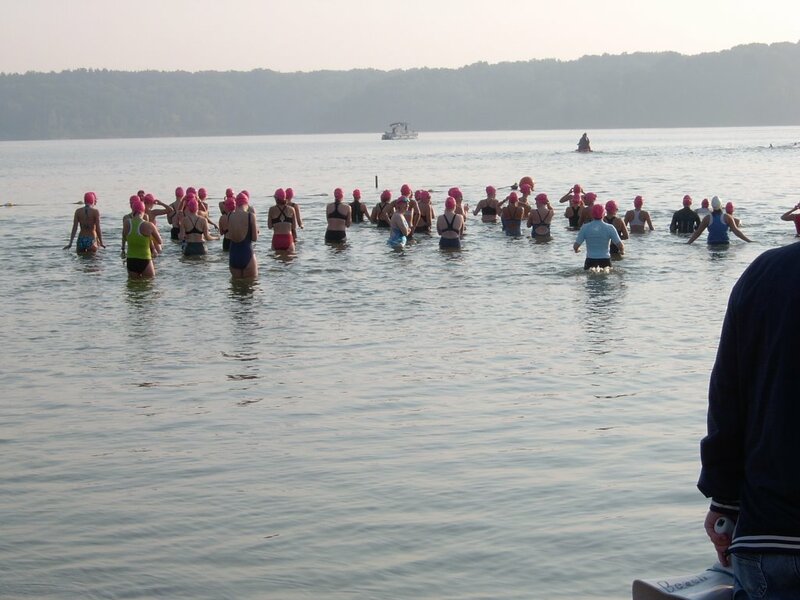 Both Elizabeth and Anna participated, and hopefully by tonight you will be able to see those pictures in addition to a few others that will show their triathlon experience. This is a pre-race picture taken right after the kid's race. I was so nervous at this point that my emotions were a little haywire. I was fighting back tears when the kids crossed the finish line. But no more time to be sentimental - it was time to get the game face on. We went back to our transition area and stripped and headed down to the beach. This was a different feeling - walking around in my swimsuit without a towel. No time for modesty, though, especially when we put on our bright pink swim caps that were required. I do have pictures of us at this point, but I didn't think it was a good idea to post swimsuit pictures without permission. Here are most of our supporters right before the swim. Jason and Shelli's mom are also taking pictures, but I think everyone else is in there. Jill also had a lot of relatives come to support her. Notice the shirts? Even the babies were wearing supportive onesies. All of the ladies went in the same heat - 56 in all. The water was not warm by any means, but it was surpisingly not cold. It also wasn't clean, but not full of fish and seaweed and muck like I had expected. My anxiety level went down quite a bit after I first got in the water. I didn't know what swim strategy to use. After watching two men's heats before us, I knew I wanted to stay to the outside so I wouldn't have to swim back to go around the buoy. It was 150 yards out, 200 yards across, then 150 yards back in. I started at the very back because I didn't know what to expect, and I didn't want to get kicked. As a result, I got quite a late start because I had to wait until I had room to start swimming. However, I swam my fastest time, and the reason why is pretty funny. The whole time there was a woman beside me swimming pretty fast, and I thought it was Shelli, so I was trying to keep up with her. I was thinking, "Man, Shelli is really booking it today, she's killing me." Every once in awhile I would yell something encouraging like "You're doing great," although I was thinking "Slow down!" We got to the end, the part where we were in thigh deep water, and I yelled, "You can stand up now!" The woman stood up...NOT SHELLI!" I don't think she realized my mistake, she probably thought my spiritual gift was encouragement. 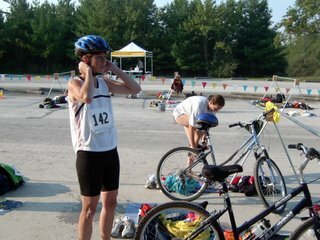 Nevertheless, she did push me to my fastest time ever, and I headed to the transition area to get ready for the bike. You can see my fancy schmanzy bike shorts in this picture - probably my best investment for the race. I had a really nice bike shirt that Shelli had borrowed from a friend, but the temperature was heating up, so I just biked in my running shirt. 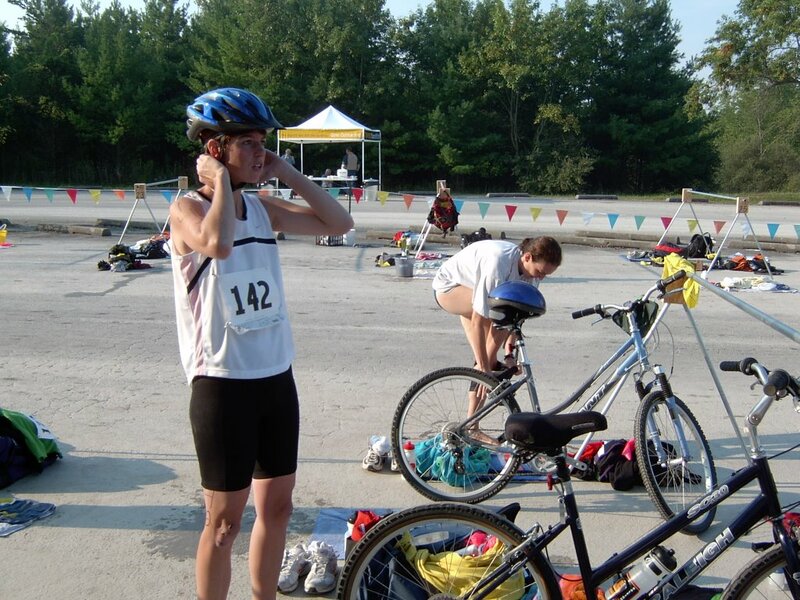 You can also see Shelli in the background getting ready for the bike. Jill was first of the three of us out of the water, so she had already taken off. The bike went very smooth. It was pretty hilly, but my speedometer said we averaged 14 m.p.h. during the 16 mile race. Our times don't reflect that speed because they figure in your transition time with your bike time, so our official m.p.h. was lower. I was happy with our time and average, because during our training, we would just keep it around 12-13 m.p.h., so to average 14 after swimming made me pretty happy. Our bike was pretty uneventful - we headed in after the ride for the 4 mile run. The run seemed to go very quickly until the last 1/2 mile - I really had to push to keep running. Shelli's dad was there with 1/4 mile to go yelling encouragement, Shelli's mom and Hannah were a little farther down, and then everyone else was there at the finish line. This experience was was of the best competitive experiences of my life. 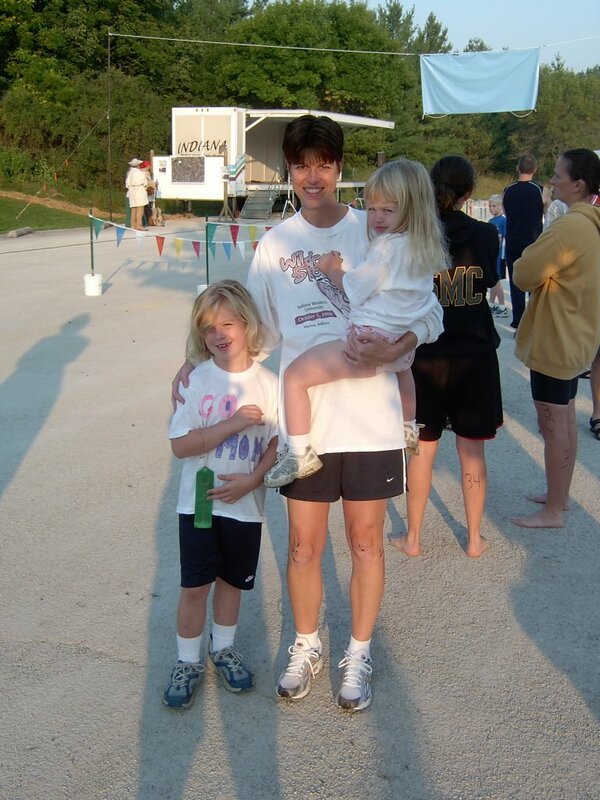 Before we started training, my goal was to finish the race. A couple weeks into the training, my goal was to finish in 3 hours. The night before the race, my goal was to finish in 2 1/2 hours. My official time was 2 hours, 10 minutes, and 35 seconds - so I was really excited about my time. After the race we headed back to the campsite for a post-triathlon celebration cookout. Again, too much food to list, but we had plenty. We were greeted after dinner with quite a rainstorm and it really cooled down. Even today, the temperature was much cooler than yesterday, so I am thankful we had the race on Saturday instead of today. Her winning time was 1 hour, 26 minutes, and 40 seconds. So there are some pretty phenomenal athletes out there. The bike is what I really need to work on if I am going to cut a lot of time off. 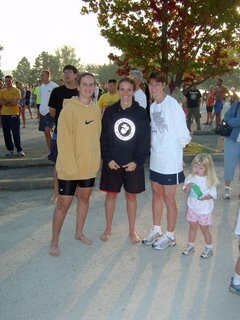 Out of 56 females, I was 36th in the swim and 36th in the run, but I was only 49th on the bike. Some has to do with the type of bike I had, but I think I could push myself harder on the training to cut time. 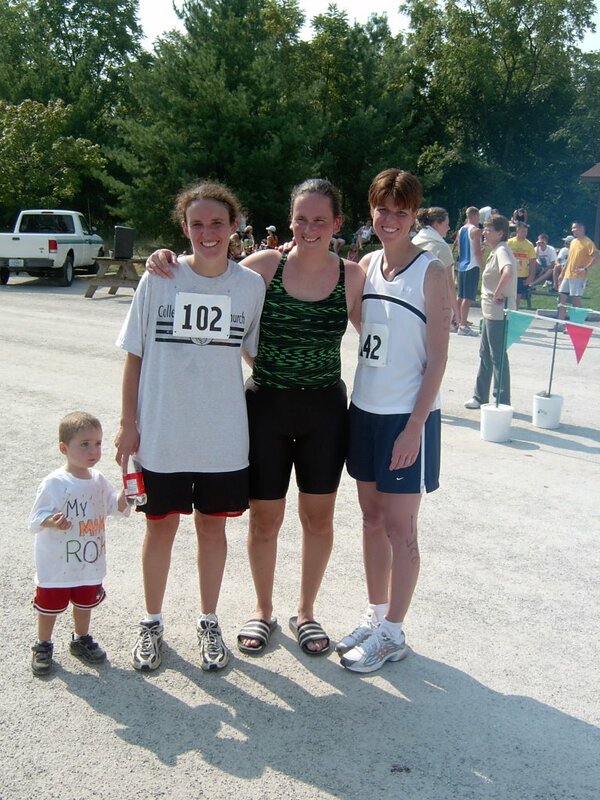 With this race I was strictly racing against my goal, but if I ever race again, I think the competitive side of me will kick in more and I will want to go after other people, too. With the equipment we had and amount of time we trained, I think all three of us did as well as we could expect - actually even better than that. What do I do now? I thoroughly enjoyed this experience and would love to do it again. I guess there are these kind of events all through the state (especially Indy) during the summer. How much would I train? Would I invest in a better bike? The competitive side of me says that I will really start to research this sport and train harder and really get involved. The practical side of me says that I am a full time working mother with a husband who already thinks I am involved in too many activities. Maybe there is a balance out there. 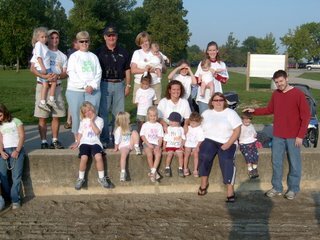 But I do know that September 8, 2007, you can find me at the Mississinewa Reservoir for the 2nd Annual Mighty Mississinewa Triathlon. Jill - I am glad you joined us in this event. Even though you didn't follow the same training guide as we did, you still did so good - you always add excitement to an event! To the bike shop owner - thank you for encouraging me to wear the bike shorts. They made all the difference in the world. To Tanna, who purchased the shirts for the fans, and to Kelley, Lynn, Missy, and Jaena who decorated them. Great fun and awesome encouragement. To the Dawsons, Mundays, Rowleys,Womacks, Wuertleys, Mom, Lynn, Missy, Jill's family, and I hope I remembered everyone - your encouragement was incredible, and I am humbled that you guys took the time out of your weekend to come and cheer us on. Mom - I am so glad you came Friday night and spent the night with us. You being there made the event even more special. Wow! I am so proud of you guys. I wish I could have been there. I hate being the only one who's not somewhere! Hopefully I can be there next year. You were awesome! Your training, dedication, commitment, and competitive spirit carried you to your personal victory! I'm so proud of your positive attitude throughout the entire training and the event. You're a great role model for Elizabeth! Next year, you'll find me there again, cheering you and the team on. Thanks a bunch for including me. I had a great time. You forgot to mention the torrential downpour we all survived Saturday night! Well, I guess you did give a play by play. Proud of you sis....sorry I couldn't have been there in body to cheer you on. Congrats on a personal accomplishment! Wow - - - it wears me out just to read about it. What a great weekend it was!! You are so welcome for everything Deb! I can't tell you how much I enjoyed listening to your stories and progress as you started your training. I seriously was in awe of the goal you guys had set! It was just so much fun to be there and watch the three of you head into the water. I felt so proud of you three! You had trained and worked so hard to get to that point. As a fan it was just such a neat experience to watch the athletes come and go through the transition points. It was fun to watch as their friends and family would start cheering when they came into sight. Their was so much excitement and anticipation as we waited for "our girls" to round the corner. I felt privleged to be standing at the finish line as you, Shelli, and Jill ran across!! What a neat experience to watch you as a social worker, wife, mother.... set a goal like this and then accomplish it. I also want to add that it wasn't as if you merely finished the race or collapsed over the finish line. You gals did GREAT!!!! You did not finish last and I think your times are impressive!! I felt motivated after watching you. Time will tell exactly how motivated I am :) I will never run a triathalon but you have inspired me to set some small goals in my life. GREAT JOB LADIES!! YOU WERE AWESOME. YOU MADE THE FANS IN THE WHITE SHIRTS PROUD! I am so proud of you!!! I know I should never say never, but I will never have this accomplishment in my life (because I'd die training). But you are my hero for doing it!!! Go Deb!!!! What as accomplishment! You guys are awesome! I am proud of you all for your dedication to the training and the race. Well done! Deb, you really are my hero. The mere thought of it is making my legs ache. Way to go. Just have to say that I miss Deb Wuertley (Overtly). With the time you are saving by not training for the triathlon, one would think you would have time to post more often...until then I will wait patiently (or not so patiently). I know, I know. I am really hoping to get something done on Sunday (after the Colts play, of course.) I've got lots of ideas in the brain, just need to translate them on the blog. I think this is my longest break yet!